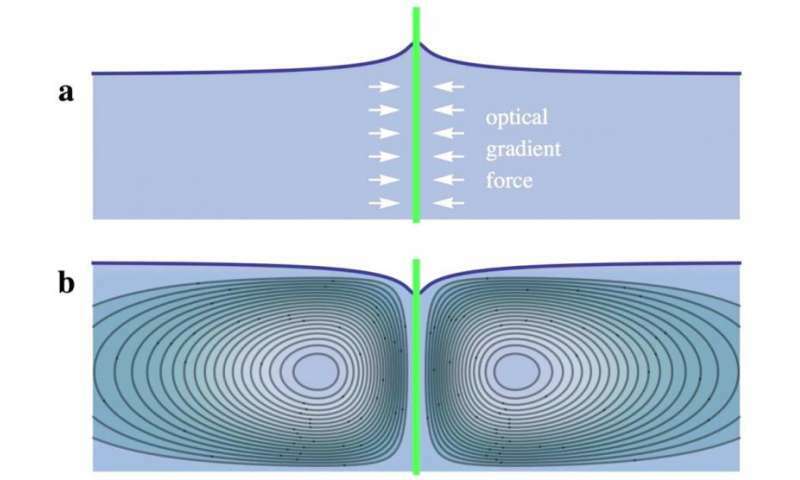 (Phys.org)—It was a very good week for physics as a team of researchers from China and Israel made the first observation of the pushing pressure of light—they were able to show the surface of a liquid bending inward when exposed to a wide beam of light in a large container. Also Texas Tech professor Bill Poirier suggested that the strange behavior of quantum particles may indicate the existence of other parallel universes—a theory he calls "Many Interacting Worlds." In other intriguing news, after years of forensic investigation, Somerton Man's identity remains a mystery, and now researchers have begun to apply modern techniques to solve the riddle of the man found dead on Adelaide's Somerton Beach back in 1948, first by looking at the history and code and secondly via DNA, isotopes, and autopsy. The man's body was found on the beach by two horseback riders, his unexplainable cause of death and piece of paper in his pocket with an apparent code written on it, caused a sensation at the time. In technology news, a combined team of researchers from several institutions in Japan announced that they had developed a solar cell that set a world record with a stabilized efficiency of 13.6%. Also, a company called Batteroo announced that it had developed the Batteriser, a $2.50 sleeve for ordinary batteries that is able to extend its life by 800 percent. Another team in Japan announced an amoeba-inspired computing system that outperforms conventional optimization methods—it is a new algorithm based on branching. Also in a bit of startling news, a team of researchers at the University of Iowa found evidence that suggests a certain kind of bacteria may cause type 2 diabetes—a simple staph infection caused the disease in rabbits. Also, another team found new evidence emerging on the origins of life—they were able to shed some light on the transition of amino acid building blocks into life that occurred four billion years ago. And finally, if you, like billions of people the world over, have been worried about growing feeble in your retirement years, you might be interested in knowing that a team of researchers has discovered a key to maintaining muscle strength while we age—it is a protein, apparently, that we tend to make less of as we age.